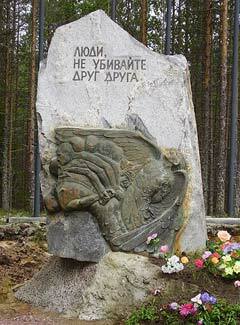 In July 1997 in the Sandarmoh woods near the town of Medvezhjegorsk (the 16th km of the Povenets road) the Memorial society expedition headed by Juri Dmitriev found the secret burials of the victims of the mass political repressions of 1937-1938. In all on the territory of 10 hectares there were found 236 graves (shooting pits). According to the archive data, from August 11, 1937 to December 24, 1938 more than 9500 people of 58 nationalities were executed by shooting and buried there: Russians, Karelians, Finns, Ukrainians, Belorussians, Tatars, Udmurts, Jewish, Gypsies, Germans, Polish and other nationalities. The surnames of 4514 inhabitants, deportees, and prisoners of the Belbaltcombinate¹ are documentarily determined on the base of the remaining shooting acts with the exact indication of the place of death. The surnames of at least 900 other people – mostly the inhabitants of the neighbouring villages are also known. The exact place of these people`s execution and burial is not stated in the documents. Also are known the surnames of 1111 convicts of the special Solovets Camp. These prisoners were executed within the period of October 27 – November 4, 1937. The largest number of archive documents on execution is about this particular group of people. Public Prosecutor of the Leningrad Region Boris Pozern. The sentenced to death (in groups of 200-250 people) were transported by the sea from the Solovets Islands to Kem, further on by the railway to Medvezhjegorsk, where they were accommodated in a wooden building of the investigation "isolator". On the execution day the condemned were undressed to the underwear, their arms and legs were tied with rope, they were gagged, and put in stacks into the bodies of the trucks, which took them to the place of execution. There the condemned were put on their knees on the edge of the pit and the shots were fired with a revolver into the forehead (and not into the back of the head to prevent the possible jump into the pit which would outstrip the shot). Most of the shots with his personal official gun fired Deputy Chief of the Administrative and Economical Department of the NKVD Administration in Leningrad region State Security Captain Mikhail Matveev. On the 27th of October 208 people were executed, on the 1st of November – 210 people, on the 2nd of November -180 people, on the 3rd of November – 265 people and on the 4th of November 248 people. Three-day break between the first and the second days of execution was caused by the unsuccessful escape attempt of several prisoners sentenced to death. They managed to unbind their hands and jump out of the body of the truck. The Administration of NKVD in Leningrad region rewarded comrade Matveev with a costly present and a trip to the sanatorium. But shortly after, during the next "cleaning" of the NKVD personnel Matveev himself was sentenced to several years of confinement, though not for a political but criminal case. Mikhail Matveev died in 1971 at the age of 79. In 1997 the Rehabilitation Committee of the victims of Political Repressions affiliated to the Government of the Republic of Karelia decided to establish the Sandarmoh Memorial Cemetery. A 900-metre-asphalt-road was constructed, a wooden Orthodox Chapel of St.Georgy Pobedonosets (Georgy the Victory-Bearer) was built, the Orthodox and Catholic Crosses were set up. On August 22, 1998 the monument of the Petrozavodsk sculptor Grigory Saltup was unveiled. The monument is a granite clod with sculptural bas-reliefs and writing: "People, do not kill each other". Another famous place burial of the victims of mass political repressions of the end of 1930-s is the Krasny Bor wood close to Petrozavodsk. ¹ Former builders of the Belomorsko-Baltisky Canal. ² Many Bolsheviks of the pre-Revolutionary time continued using their secret Party membership aliases.